Is Dublin a low density city? 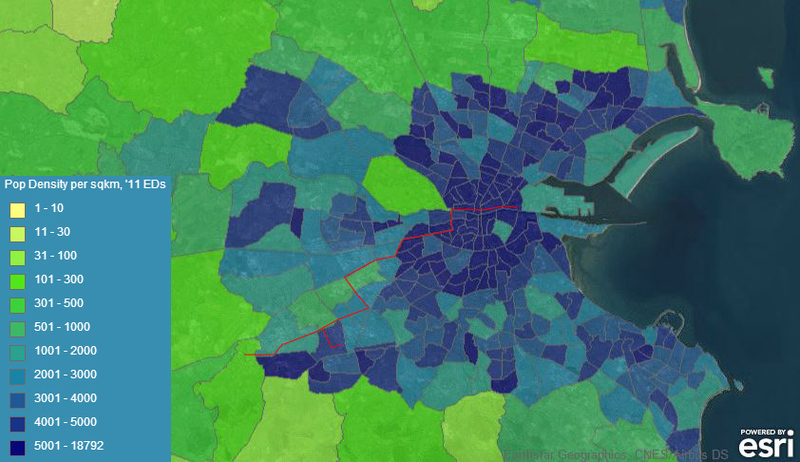 COMMENT & ANALYSIS: We’re often told that Dublin is “a low density city”. But there’s usually nothing to back this up, except a mix of people’s feelings and snippets of information. Often there’s nothing at all backing the claim up — Dublin is low density and that’s it. One of the few references in media which counters the prevailing view is a 2010 Village Magazine article, which quotes a Dublin City Council report from 2003: “The density of persons per hectare for the DCC area is comparable with the corresponding figures for cities such as Amsterdam and Copenhagen”. Did nobody send the memo to Tierney? Amsterdam, on the other hand, has the density to support a network of tram lines and a metro system (and is building another metro line). And the city is clearly suitable for cycling in density-terms. Dublin, however, we’re told again and again is a low density city. Low density, which we’re told, is not suitable for nice things like Dart Underground, Metro, Luas lines and, even, a network of cycle paths. Comparing Dublin with Amsterdam presents a large problem with the idea of Dublin as a low density city — both cities are comparable. Both in population terms and area terms — thus, also in population density. The cities are a good match to compare for other reasons too: Both are capital cities, have a relatively large restrictive historic city centre with little or no scope for new roads, historic battles to bulldoze new roads which were stalled, and both are not landlocked cities. NOTES: Dublin city = Dublin City Council area; Amsterdam city = Amsterdam city council; Amsterdam urban = CBS defined ‘Grootstedelijke Agglomeratie Amsterdam’; Dublin urban = CSO defined ‘Dublin city and suburbs’ (both based on UN definitions where urban areas have expanded beyond their boundaries); Dublin city centre = area between the canals (aka the ‘inner city’); Amsterdam excludes water area for area calculations, Dublin does not. View in Google Sheets. The above table shows that Dublin and Amsterdam are comparable when comparing the “city proper”, ie the city councils’ administrative areas, as well as both cities city centres (both highlighted in green) — with Amsterdam having a bit of a higher density in these areas, but, in international terms, the difference is small (if you include the area of water in Amsterdam’s area calculations, Dublin has higher density). We should also look at the city and its wider suburbs, which includes what is known as the continuous urban area. In Dublin’s case this includes the full administrative Dublin City Council area plus the connected mostly urban parts of Dun Laoghaire, South Dublin, Fingal which are closely linked to each other. When we look at this, there’s a lower density than the city proper in both cities, and — wait for it — Dublin shows a higher density than Amsterdam in this area range. Overall we can say that the cities are comparable. By the way, that’s 24% of the Republic of Ireland’s population in just 0.45% of the landmass. That’s relative density even if there’s no other measure looked at. Further out geographically around Dublin and Amsterdam, it looks like the city region in the two city are not so comparable. But as we highlight in the table we’re not sure if the data is comparable. The ad-hock measurement used to get the density of the Greater Dublin Area is a simple area by population calculation, including the size of rural area km2, however, the Netherlands (and other countries) seem to exclude most rural area. Can you have urban sprawl and urban density? Urban sprawl and urban density are not mutually exclusive. Good planning in most European countries includes urban density in cities and planned commuter towns/cities. The problem Ireland had (and still has?) is that it was not planning its commuter towns in a way which would be sustainable for rail transport. The amount of one-of-houses allowed was also crazy, but even besides that fact, there was a lack of a concerted plan for sustainable dormer towns. The urban sprawl is in a way a distinctly a different chapter of the story. The density within the continuous urban area can and should support good sustainable transport. Over the last few years when reading about this topic, one image kept popping up — it’s from Towards an Urban Renaissance, a 1999 report by the Urban Task Force which was set up to answer how 4 million new homes might be accommodated in the UK. While the Urban Task Force was looking at the best planning and design practice, the image is also very useful in looking at existing population density. 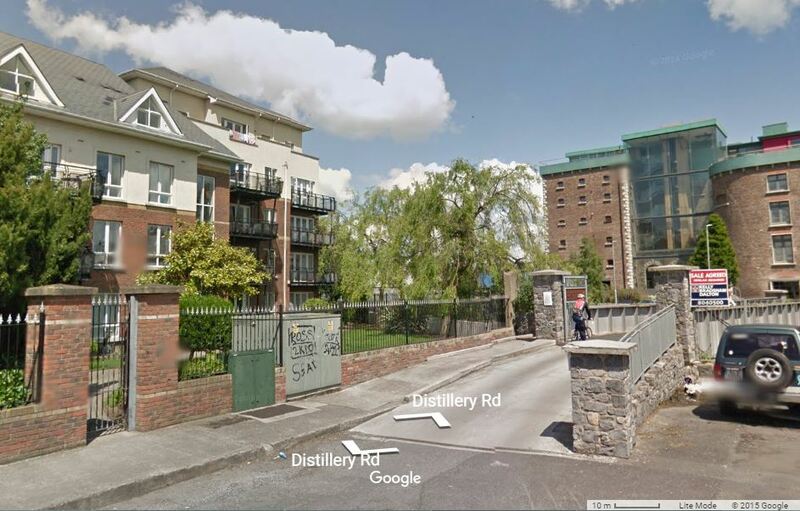 It shows how rows and rows of compacted two-story housing with small gardens (which can be found in parts of Drumcondra, Stoneybatter, Fairview, Portobello, Cabra, Lucan, Tallaght etc etc) can amount to as much density as more bulker-looking buildings. The issue of which design is better is subjective — what’s clear is there is hidden density in Dublin’s low-rise housing (most of that is from compactness, although other times it’s added to by subdivided houses). For those still in disbelief about Dublin’s density: Airo at The National University of Ireland in Maynooth have done some stellar work mapping Ireland’s population data, including density. Click on the image below to see a larger image or the link below it for an interactive map, but basically dark blue is higher density, lighter shades are lower and green is relevantly low density. The map shows that there are some relatively high density areas even outside the M50, including large chunks of Blanchardstown and Tallaght. But, maybe, what’s more surprising to some people is that there’s high density in Dublin city and most of its inner suburbs. 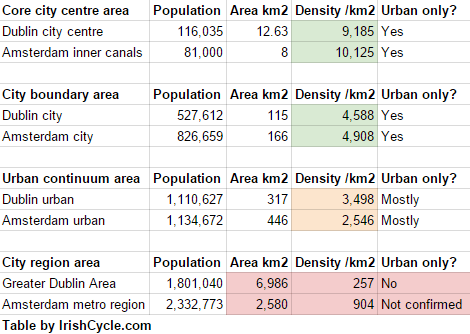 There’s some people who live away from the city centre who think very few people live in and around central Dublin — the truth is, the area between Dublin’s canals is the highest density in the country. The fact that a large percent of some generations have left the city does not change the fact that a growing amount of people are living in the city. There’s a few issues to note: (1) a smaller (electoral divisions) area can reach high density a lot quicker than a larger one so clusters of small high density areas show more substantial density; (2) close to the city are a number of industrial and business park areas are lower population density in those areas (ie Dublin Port and the Naas Road); and (3) parkland and nature reserves areas stand out, such as the Phoenix Park and Bull Island (the former is self-contain in nearly its own area, while the latter is on the map linked to the adjacent residential area, making it look like it has lower density. The same map is cropped below with the Luas red line shown as a red line. For those not aware of Luas: Luas is a modern low-floor tram system, with two soon-to-be connected lines. It has been highly successful with high usage even off-peak and, bar a few years, it has been running an operating profit. 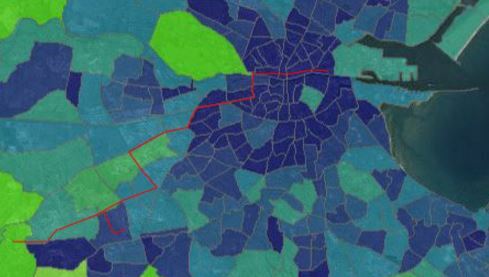 As is clear from the map: The tram route does not travel in the highest density areas. Some of these have scope for higher density on in-filled sites, but the Luas route is already popular and jam packed at rush hour (only some of this is accounted for by non-housing trip generators in low population density areas). If a high-capacity and high-frequency tram line works along the red line route as it is now, it could work along nearly every, if not, all arterial routes in the city (where there’s other non-housing trip generators). There’s no question that the city’s density would support mass cycling (we’ve already tackled the distance myth here). And the overall statistics indicates that an Amsterdam-like metro system could work in Dublin. Now, can we please stop calling Dublin a low density city? Can we stop using density as an excuse for car dependency? Can we stop using it as an excuse not to fund better transport options? It’s hard to believe that anyone can look at the inner city and inner suburbs and conclude that Dublin is low-density in those zones. I have known about this ‘lie’ for the past few years as a result of being involved in local planning objections. Who is its continuance aiding? So that actually makes cycling even more necessary. 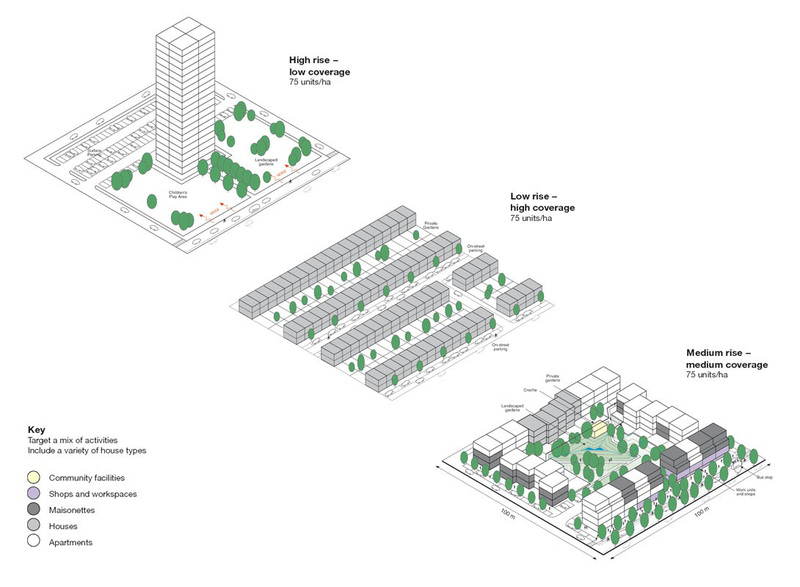 It suits Dublin City Council to pass the city off as low density so they can give permission to ridiculous developments, but densities in the centre are actually high as the piece says. Any problems Dublin has relating to density are due to chronic, low-density development sprawling for 30 or 50 miles outside the centre. Dublin inside the canals is a high-density area. The low density is in the suburbs. Kevin – you got it! Sprawl as far as ‘The Fields of Athenry’ was the order of the day in spatial-planning. A very interesting and eye-opening article. Thank you. @Blom — Dublin as well as Amsterdam and other cities like them are probably best described as medium density. I really don’t know what you’re talking about so few people out walking about — yesterday, I was in the inner city early to mid morning and it was already busy enough to have some footpaths to be too busy, and I was at the edge of core city centre around 6pm and it was busy with people. As for shops — Dublin City Centre is packed with shops, possibly more so than Amsterdam. I’d love more Luas routes but there isnt more space in the city centre for them. Underground is the only option. There’s more than enough space for more surface trams in Dublin, for example as planned to Ringsend, Finglas and Lucan and maybe also as a replacement the better quality bus corridors on the main routes. That’s not to say you also don’t have metro and Dart upgrades, but surface trams can be a good part of the transport mix.